The relationship between esports and the event-production community continues to expand in new directions, and the most recent new direction is Las Vegas, where Allied Esports has opened Esports Arena, a 30,000-sq.-ft. venue and production studio in the Luxor Hotel and Casino. And it’s not stopping there: on May 12, another facility will open in Oakland, giving it three in the U.S. (Santa Ana, CA, was the first) in addition to arenas in Beijing and Shenzhen, China, and Hamburg, Germany. Head of Content Drew Ohlmeyer sees a real opportunity for Allied Esports to be a force. Many of the game studios and arenas are built for a specific game title or game publisher, but the Allied Esports model is open to all, giving its production team a chance to quickly become experts in a multitude of game styles. Esports Arena Las Vegas celebrated its grand opening in March. The arena is modular, allowing the space to be transformed to fit any game. Player pods, for example, can be set up on the stage for one-on-one battles or any configuration up to six vs. six. In creating the stage, Jeff Hall Design Group designed a row in the back where the pods are tucked away when not being used. The arena’s grand opening highlighted the flexibility of the space, with three games played. Smite, Dragonball, and Rocket League each required a different configuration, and getting the stage ready for the next competition takes only 20 minutes. 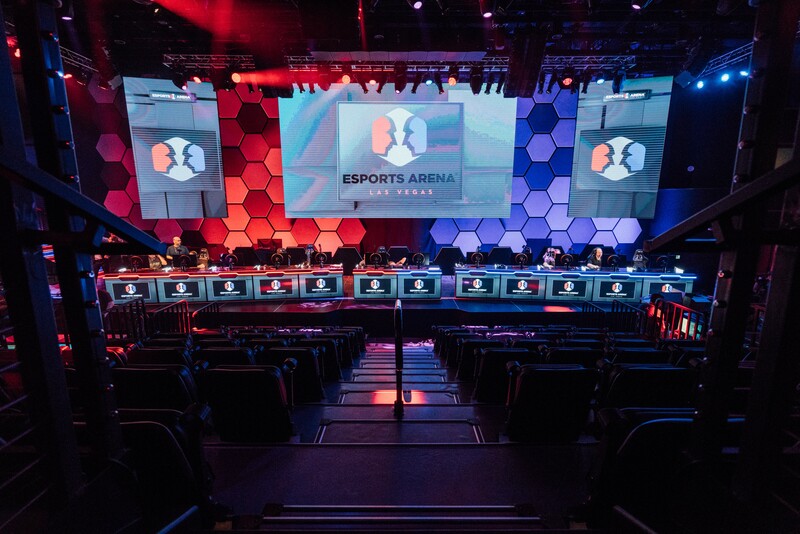 This past weekend, the arena hosted an event around the game Fortnite: Ninja Vegas 18. Ninja is the superstar of the game, with 1.76 million followers. Fortnite is a multiplayer game with as many as 100 people competing in the same match, and close to 750 people turned out for the event (capacity is 1,200). The arena floor had 75 gaming stations, allowing 233 competitors (including Ninja) to compete in three separate heats. 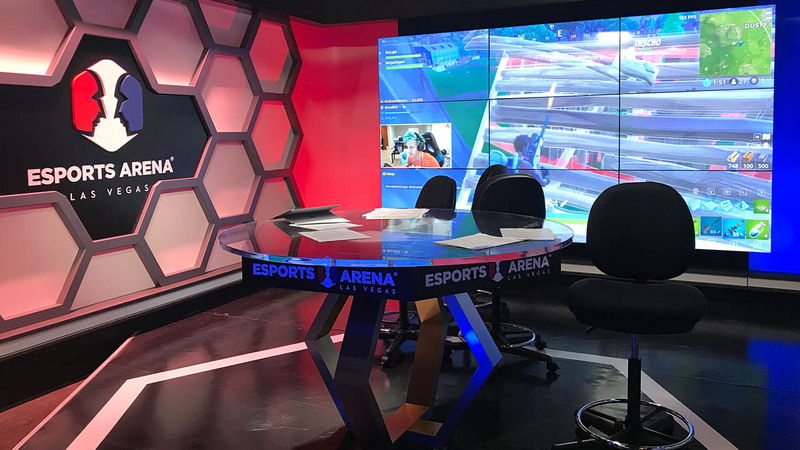 The back-of-house area of Esports Arena features a 1,000-sq.-ft. studio. The back-of-house area includes a production-control room, a 1,000-sq.-ft. studio, and an observer area. CBT Systems was involved with much of the project, with President Darrell Wenhardt guiding the engineering and facility build. Ohlmeyer and Wenhardt began working together when the NFL Network launched its facility. The arena’s technical-productions elements include a front-of-house system and a broadcast/streaming system. The two systems share core equipment, according to Wenhardt, including an Evertz 3-Gbps HD-SDI video and IP/AV router, Lawo audio router, AJA and Ross video processing, Riedel intercoms, and an Evertz KVM system. A Grass Valley switcher for broadcast and a Ross switcher for streaming support a combined five channels of program release. Broadcast monitors are from Sony; other displays in the venue are from LG. The observer area is key to the show, allowing four or five observers to watch the game, keep track of the action, and help guide the production. The front-of-house tech ensures that fans in the venue have a great experience, thanks to a Ross Carbonite switcher with a hybrid Ross Expression and Reality Check/Vizrt graphic engines that pixel-maps images to the arena’s DST LED screens. The house PA is all-Harman, with JBL speakers, Crown amplifiers, and BSS digital-audio processing. With the combined power of the front-of-house and production tech, Ohlmeyer believes, the arena will prove attractive to a lot of publishers.